Exhibition “Unnamed” of the young Ukrainian sculptor Ivan Svetlichniy is about to open on September 21 in Kyiv. 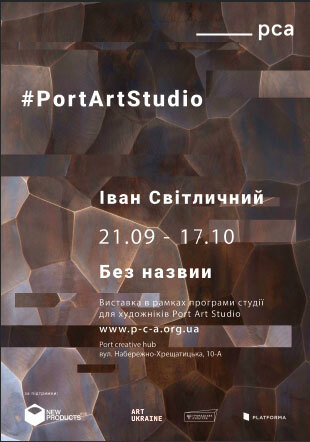 It will be held within the program of the art studio #PortArtStudio initiated by the Platform for Contemporary Art (PCA) and New Products Group. Young artist is going to present the public with five sculptures which he started to make in 2010. In his artwork Svetlichniy explores interactions between real objects and images that arise in the human mind within their perception. The author offers visitors to interpret sculptures independently by concentrating upon their own experience and impressions. That is why the artist doesn’t comment on his work. «Ukrainian artists that work with experimental art are usually searching for the support of their ideas and creative space. Our company decided to encourage the #PortArtStudio project, as it may become the impulse for the creation of the long-term residence. We believe that successful future of the whole country and certain businesses depends also on the young people’s desire to develop culturally and get new skills and knowledge», – says Viktor Gordeyev, the partner of the New Products Group. Ivan Svetlichniy is the founder and tutor of the artistic self-organization 01011101; he is also a tutor of the creative exhibition center “TEC” in Kharkiv; his works participated in numerous Ukrainian and International creative projects. At the exhibition “Unnamed” Svetlichniy will present sculptures made from stone, wood, copper and coal. Svetlichniy’s “Unnamed” project is the fifth of the eight exhibitions planned for 2016 within the framework of #PortArtStudio and supported by the New Products Group. The showroom is open every working day from September 21 until October 17, 12:00 p.m. to 19:00 p.m. and can be found at the creative space Port creative hub, Kyiv, Naberezhno-Khreschatytska str, 10-а.